So after 20 years of democracy, South Africa’s 5th Democratic Elections happened on the 7th of May 2014. Did you exercise your right to vote? For weeks beforehand, I couldn’t find my ID. Eventually after turning everything in the house upside down I found it, on voting day (obviously) in a ‘safe place’ (obviously) with other important documents, in a box atop my desk (obviously). It’s pretty hilarious but I’m really glad that in the end I got to make my mark. I voted around 4pm, the queue was only about 15 people long and it went very quickly and efficiently, I was there for no more than 15 minutes max. In comparison to the 2009 elections (which was my first time voting and stood in a queue for about 3 hours) this time round was a much more pleasant experience. 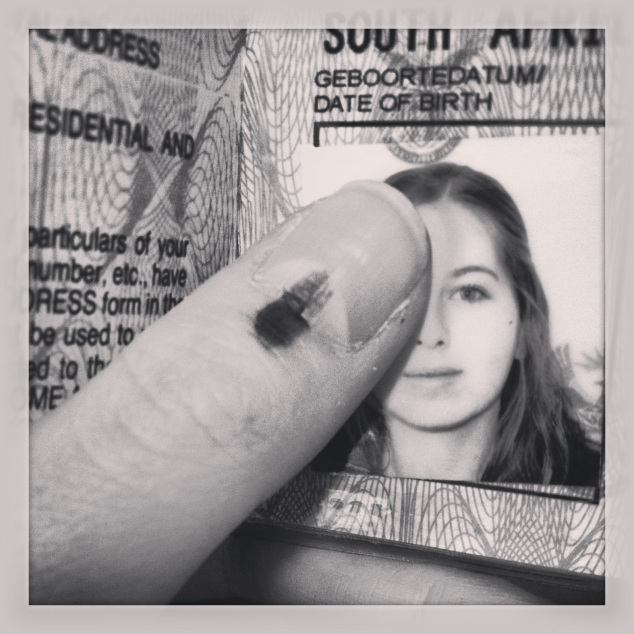 I was so happy, I even high fived one of the IEC (Independent Electoral Commission) guys at the end, when I was done. I also made friends with some people in the queue. I do this often, I’ll be waiting in a queue (be it 5 minutes or 5 hours) and inevitably converse with the people around me quite comfortably, which seems to be a family trait. How can you ever make new friends if you never chat to strangers? So that said, I chose to try a different approach to my interaction with 7 strangers. The number 7 is not only symbolic in biblical scripture but is also symbolic of luck, intelligence, focus, knowledge, contemplation, perseverance, grace and inner wisdom. Which is what I was hoping to gain from this experience. I’m not the biggest fan of street beggars, ie: those who have babies (this is child abuse), people who dig in the dustbins (that’s fine, but then leave it as you found it, don’t mess up the pavement), people who walk with blind people with them (this is also abuse), people that appear to have disabilities (like walking with an exaggerated limp) which are mostly fakes, and those who spin long stories to con you out of a few bucks. They all try to guilt trip you, and I never know which story is real. I work hard for my money, don’t guilt trip me. I know it’s difficult to find jobs in this economy, but it always makes me think: have you actually tried? Have you done everything you can to find a job, have you exhausted every option, or are you just lazy? Also car/security guards: some of them genuinely care about your security, but others will stand in your way so that you can’t move your car unless you give them money! I needed to change my thinking, I needed a different perspective. Apparently the more you do for someone, the more you will like them; not actually the other way around. 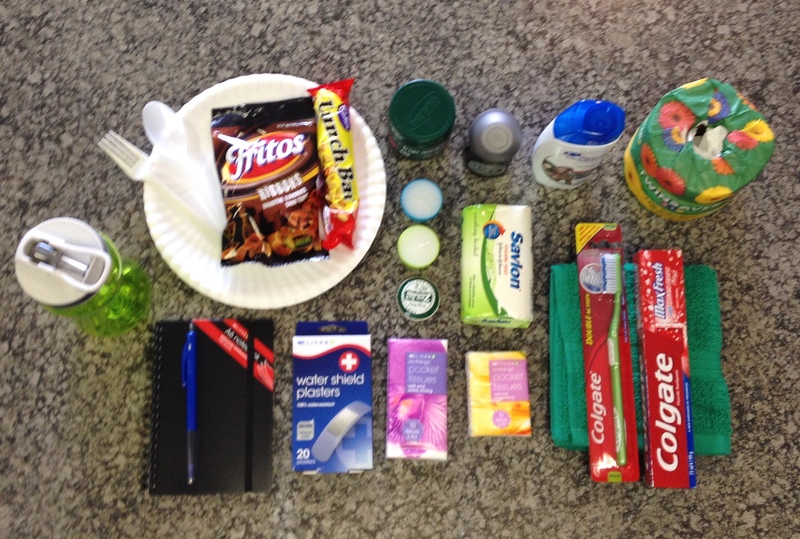 So, on voters day, I made up 7 bags that contained these essentials: 1 bar of soap, 1 bottle of shampoo, 1 tube of toothpaste, 1 toothbrush, 2 small packets of tissues, 1 face cloth, 1 packet of plasters, 1 toilet roll, 1 roll on deodorant, 2 tea light candles, 1 tin of Zambuk, 1 bottle of Camphor cream, 4 paper plates, 1 water bottle filled with water, 1 pen, 1 notepad, 1 Lunch Bar, 1 packet of Fritos chips, 1 plastic fork, 1 plastic spoon and a small lunch time meal (a pie or a burger). The first 6 people got the same deal inside their bags. The 7th person, got an extra lunch bar, an extra packet of Fritos chips, 15 paper plates, an extra toilet roll, 3 extra tea light candles, a bunch of bananas, a loaf of bread, a mini cooler bag (which I’d been given for free) and a peak cap (which I’d also been given for free) and one of my old favourite warm scarves. Number 7’s bag was a happy sunshine yellow. He was wearing a beanie with the South African flag on it, which I felt was fitting for the celebration of 20 years of democracy. I truly hope that I gave this last bag to the right person. The people I chose were on the spectrum of what I explained above and guess what?! Their reactions were mostly appreciative: lots of thank yous and God bless yous. Although, one guy saw me giving something to another guy, ran up to me and started thanking me before I even gave him anything, then I felt obliged to give him a bag. Then his friend sitting close by just sort of held out his arm waiting for a bag of his own, kind of greedy actually. I gave him one, but received no thanks or appreciation at all. But whatever… in the end it didn’t cost me that much money, or that much time, and it’s good to see that most people were really grateful. 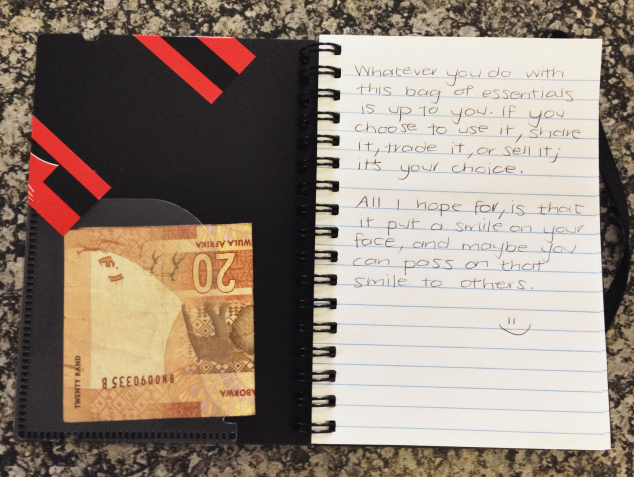 Inside each of the notepads, I stuck R20, with a note on the first page. I had a roof over my head, a warm bed to get into at night, a steady job and income, and was surrounded by amazing friends and family. It must be a very lonesome life on the street without some of these basic things in life. I’m very grateful for what I have. 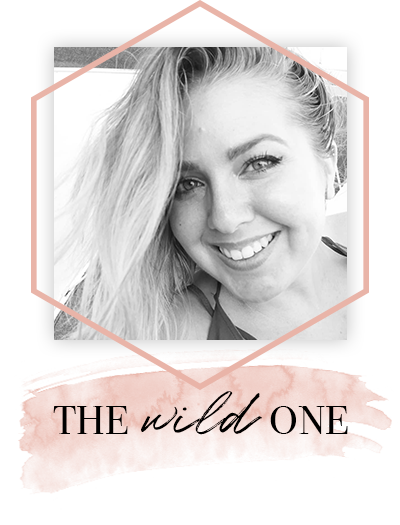 I wanted to pay it forward and see if I could actually make a difference in someone else’s life (or perhaps at least their view on it) even in the smallest way; and I think that maybe I did. All it takes is one small gesture to create one big life changing moment. That’s why I voted for change; because person by person, I believe that we can change the world. I believe we can change the country, I believe we can change the lives of others – and most importantly I believe we can change not only our lives, but also ourselves. Like the cover image artwork? Purchase the design and apparel here.